I am so thrilled to be the guest of the amazing Rita for this event. 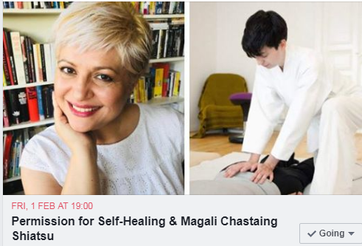 We will talk about a topic very dear to my heart: how to give yourself permission for self-healing. I will explain what happens in your nervous and energy system, give you technics to use on your own and ask for support when you need it and we will experience our bodies with a new perspective. Rita will illustrate all this with her own fascinating experiences and hold the space with her big big heart. I am very much looking forward to share this moment with you!